Ruskin Bond vividly recalls his last outing with his father in the essay, Remember this Day. His father had come for a day to meet him at his boarding school in Shimla. They went around and had fun. Since I had recently visited that place, I tried to picture the places he describes in the essay. And provisioning ourselves with more pastries, we left the Mall and trudged up to the Monkey Temple at the top of Jakko Hill. Jakhoo or Jakko Hill isn’t the same as it was in those times. I stumbled upon an old photograph of that place. It was on Wikipedia. 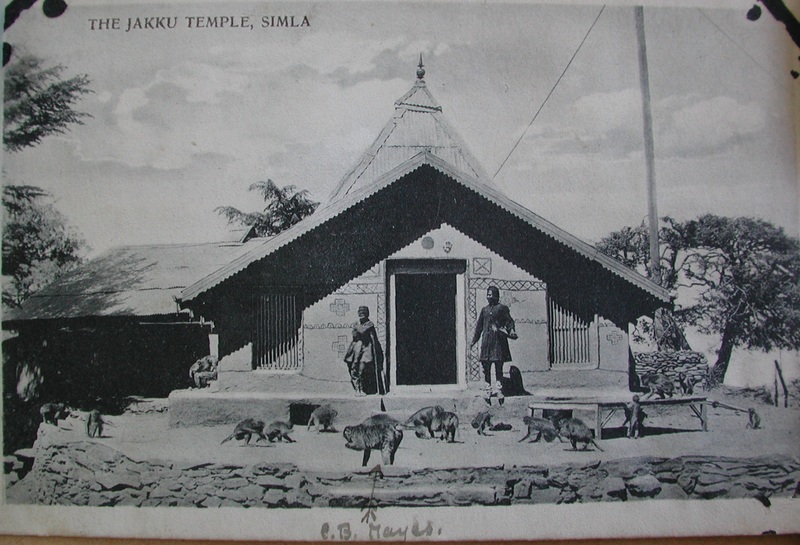 This humble temple of 1912 is a far cry from its modern edition, which features a huge Hanuman statue that is visible from afar. … and it hadn’t taken me long to discover the Shimla cinemas. There were three of them — the Regal, the Ritz and the Rivoli. Of the three, only the Ritz still exists. It is right behind the Shimla Church. In 1983, Regal was burnt down and in December 2010, the government declared that the old Rivoli building was too old and was unsafe for public. This is where Mr. Bond went to watch Sonja Henie. He mentions three eateries, Davico, Wenger and Clark. Neither of those featured anywhere during my online search for good eateries. Maybe they have shut down. Or maybe they are still there like relics of the past. This blog mentions these places and also the act of ‘[sipping] a glass of cool bear [sic]’. He also mentions riding rickshaw around Elysium Hill. I did not go there. The essay ends on a bittersweet note. Little did Mr. Bond know that that outing would be the last time with his father. Three months later, he died in the Calcuttal Military Hospital.